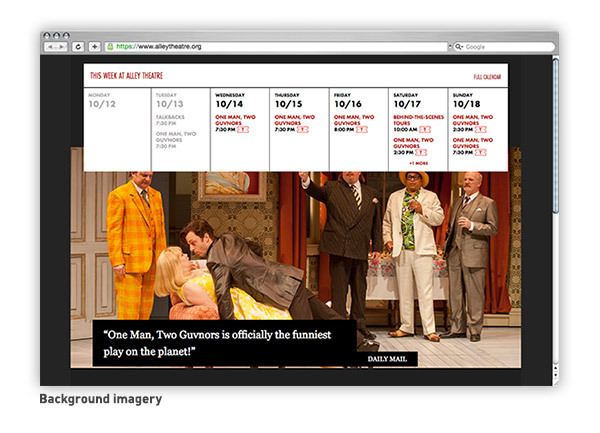 L2 Interactive is pleased to announce the recent launch of the Alley Theatre’s fully Tessitura integrated website. 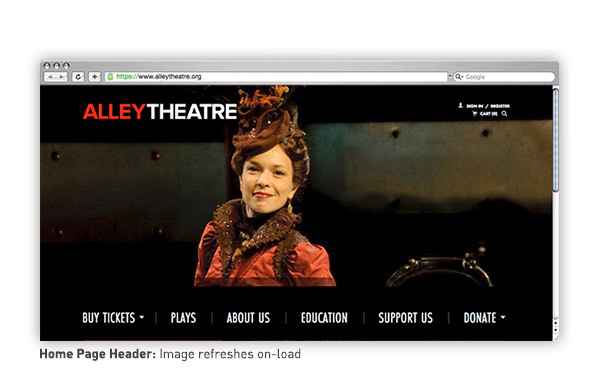 The Alley, located in Houston, Texas, is a nationally recognized performing arts company, producing more than 500 performances per season of innovative productions of classics, neglected modern plays, and premieres. During their 2014-2015 Season, Alley underwent a $46.5 million building renovation. In keeping with the theme of renovation and rebuilding, L2 was delighted to partner with Alley to complete a website overhaul and dream up what was possible, from the ground up. 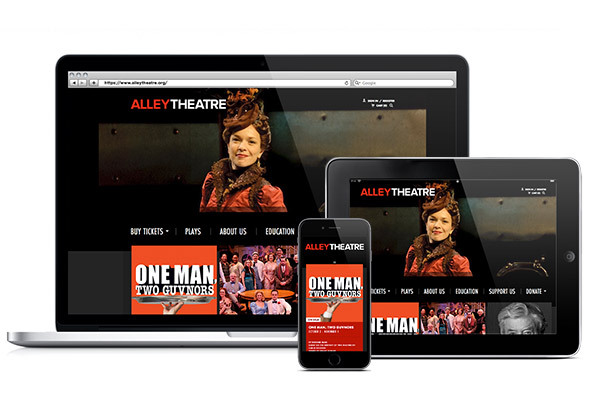 As home to a recognizable resident company of actors, the Alley wanted to make sure that the website’s design was infused with imagery and ambiance that captured the energy and essence of their company. 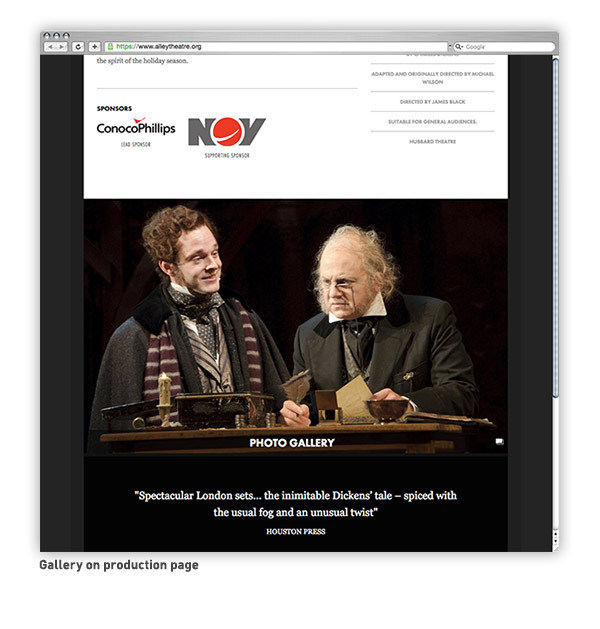 With this in mind, L2 designed the entire site with the actors as a focal point. Careful not to distract from the overall transactional purpose of the site, L2 incorporated the company in purposeful ways, featuring them on page-headers, wayfinding navigation, background imagery on home and production pages, and in large, exaggerated galleries. For direct, immediate access into both the purchase and donation paths, L2 implemented both Buy Tickets and quick Donate buttons into the site’s top level navigation. 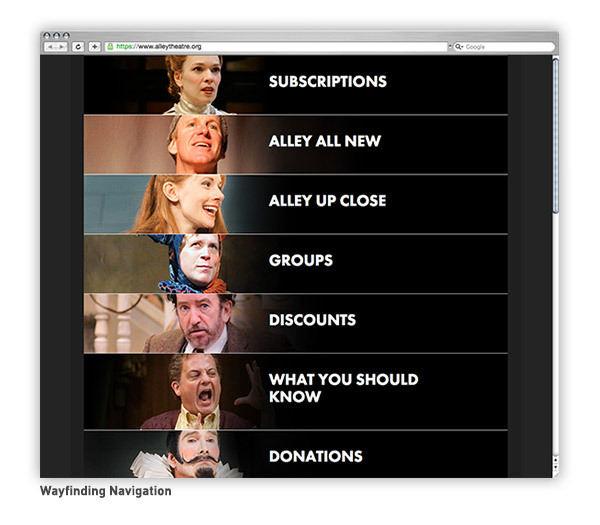 Clicking the Buy Tickets button reveals a drop-down list of productions and subscriptions controlled by the Alley and choosing a production sends the patron directly into the purchase dialogue. 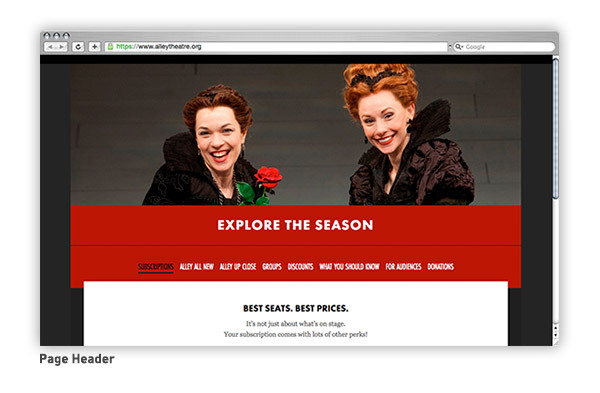 Not only does this give the patron easy access into the purchase path, it also allows the Alley to highlight productions and packages for sale. Clicking the quick Donate button reveals a donation widget, allowing the patron to enter any donation amount into the cart with one click. This donation goes into Tessitura as an OnAccount donation, allowing for this contribution to be truly “quick” without all of the typical questions of a donation form. For the Alley’s Development department, L2 wanted to make donations as easy as possible. 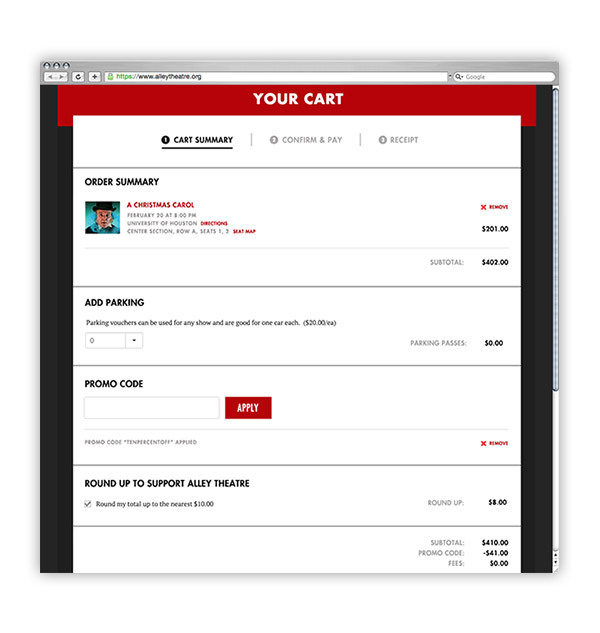 Aside from the quick Donate button, we also made improvements to the donation form and in-cart donation asks. Now, at the top of the donation form, patrons can simply enter the amount that he or she would like to donate, and benefits of that level automatically populate to the right of the donation amount. 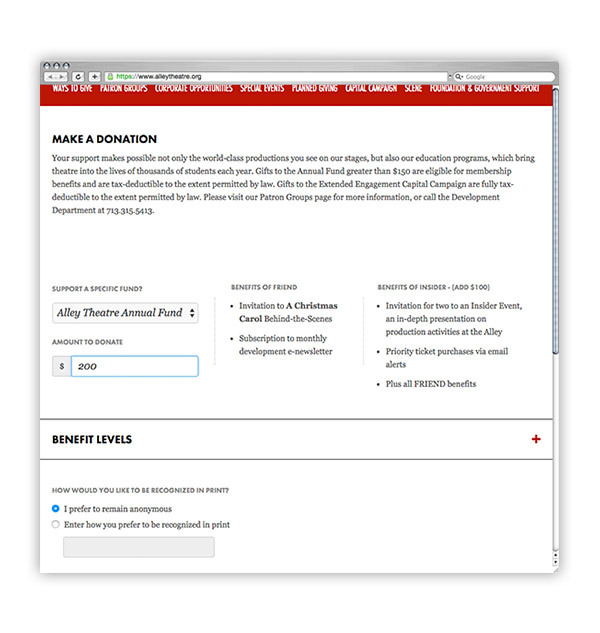 In addition, the form automatically calculates the dollar amount needed to obtain the next level of membership, enabling the patron to see the additional available benefits if they donate slightly more. In the cart, L2 made sure that the patron had the opportunity to add a donation. To do this, we set up conditional rules assessing the contents of the cart. If a donation is already present in the cart, no other ask is made. However, if no donation is present in the cart, patrons receive a simple donation ask. If they decline this ask, a round-up donation is presented within the cart.